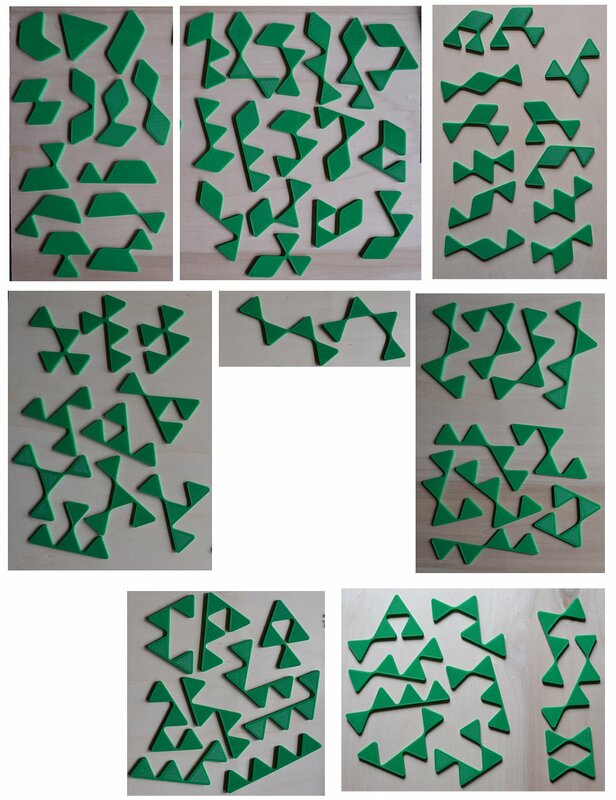 The picture shows the 82 bridged tetriamonds as real pieces. First I printed the top and the bottom face of each piece with a 1mm thicker edge. Then both parts were glued together with two 2mm thick magnets inside. This way it is easy to fix the pieces on iron boards. To spot a special piece in the set you can divide the set into subsets with equal numbers of bridges. If there are more than one bridge you can count where and how often each kind of bridge exits. This depends on the number of connected triangles and the angles at both sides of the bridge. Unfortunately there is a parity problem with the pieces. We can call a piece odd, if the number of white triangles under checkerboard coloring is odd. Because the number of odd pieces is odd constructions with two orthogonal axes of symmetry aren't possible. The figure with triangle symmetry shown at the initial page was constructed more than a decade ago. Now I looked for convex polygons some of them with one mirror symmetry. Now a,d,b,e,c,f are the side lengths of an hexagon if all values are greater than 0. A side length of 0 indicates a 60 degree angle between the neighboring sides giving one corner less. Here are all symmetric hexagons. At last I solved one pentagonal figure. I think solutions exist for all other listed polygons. It seems to be possible to construct 9-fold replicas of some of the pieces. 81 pieces must be used and one piece is left. This is odd if the replicated piece isn't odd and vice versa. First I tried to replicate the pieces without bridges. 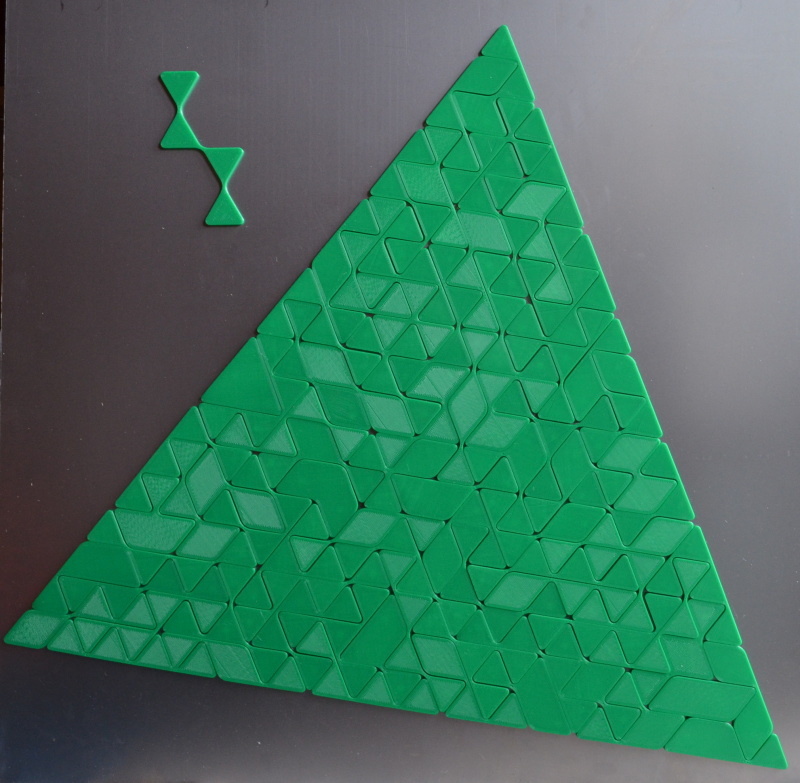 This is the triangle shown with the real pieces. The parallelogram and the chevron are also possible. So far I constructed the 9-fold replica of a piece with only one bridge. 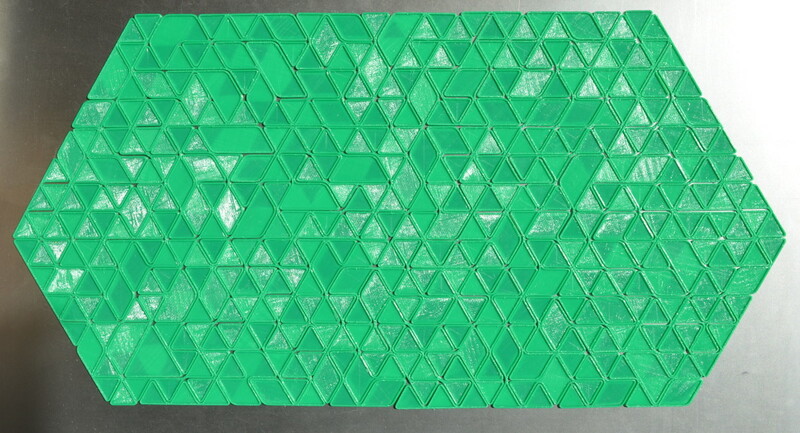 Here are the 143 one-sided bridged tetriamonds with a total area of 572 triangles. A SVG-file to print or cut the pieces is also provided. Since the number of odd pieces is odd we have the same parity issues with this set as with the double-sided one. So we can't get constructions with two axes of mirror symmetry. But there exist a lot of convex polygons which can be made. For neccessary conditions look at the double sided set with total area condition changed to g*g-a*a-b*b-c*c=572. If all values of a,d,b,e,c,f are greater than 0 we get a hexagon, one zero indicates a pentagon and two zeros a quadrilateral. I constructed only one asymmetric pentagon. Another one can be made by joining the two rhombs where one corner is cut. Here are two asymmetric hexagons. There are two symmetric hexagons one of them is shown with the real pieces printed with a 3d-printer. To get no problems by assembling the pieces you have to print them with a small inset. 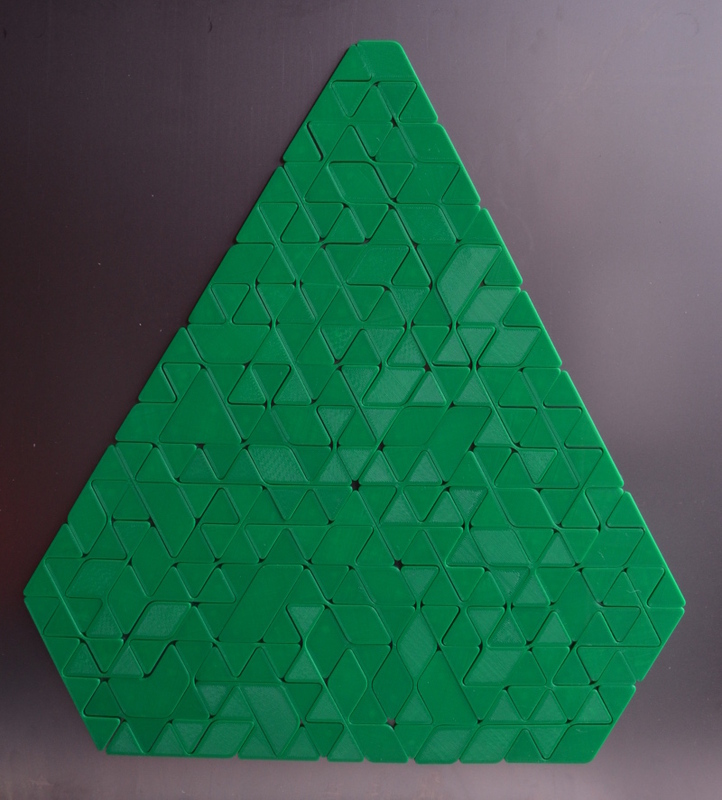 If we add another odd pieces to the set for instance the triangle shaped piece, the number of odd pieces is even and no parity problems arise. Furthermore we have 144 pieces which is perfect to look for 12-fold replicas of some pieces. If we add the triangle shaped pieces at the top of the trapezium shown above, one replica is found. With the following constructions it's possible to replicate pieces with at most one bridge. If we use the extended set constructions with hexagonal symmetry can also be made. 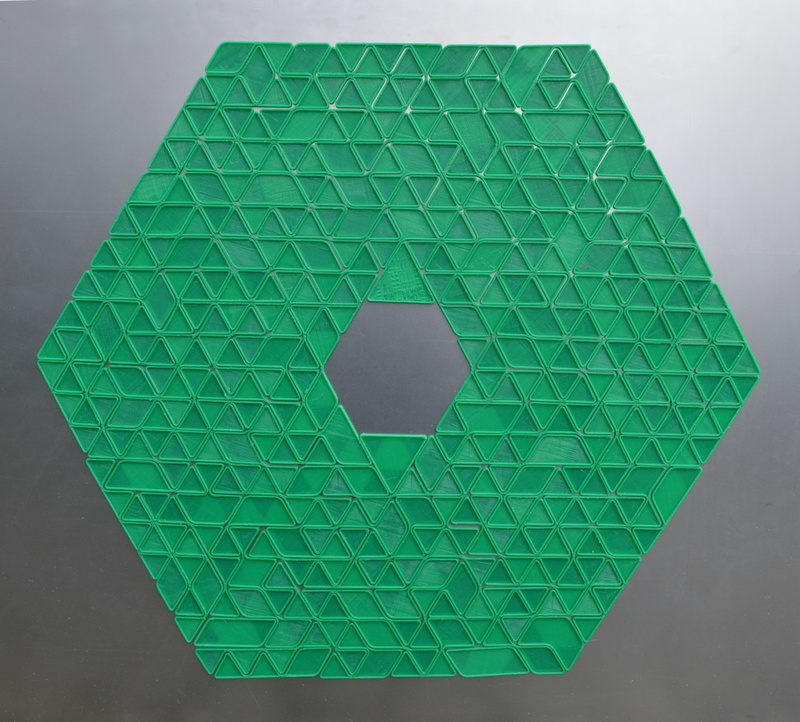 We can also make 4-fold replicas of hexhexes, if we replicate all six combinations of trihexes. These replicas can be joined to get hexhexes. There are only few hexhexes, which can't be replicated this way, but all solutions seem to be possible. An example with triangular symmetry is shown.